It's impossible for me to overstate the importance of Christopher Isherwood's spiritual memoir, My Guru and His Disciple, to my own spiritual development. I read it in late 1998, after my reawakening and the birth of my daughter. At that point, it immediately became the third book in what I then considered to be my spiritual canon, along with Autobiography of a Yogi, and The Gospel of Sri Ramakrishna. While Autobiography inspired me to look for a guru and take up the spiritual life, and The Gospel inflamed my spiritual desire to its peak, Isherwood's loving and critical look back at his own guru, his own "Center," and his own spiritual life was instrumental in my ability to critically understand my Center years and to understand them in context. Isherwood was born in England and educated at Cambridge. In 1939, he emigrated to the United States to avoid being drafted at home. While living in Germany during the 1930s, Isherwood had fallen in love with a young German named Heinz. He couldn't bear the thought of facing Heinz on the battlefield and sought to avoid such a confrontation by seeking work in America. When he arrived in Los Angeles, Isherwood didn't believe in God, at least not the white-haired old man ruling from a golden throne in heaven, the one praised by "crosstians" and who apparently could not stand a certain segment of His own creation known as homosexuals. Then he met his guru. Isherwood's guru was Swami Prabhavananda, of the Ramakrishna Order. Swami Prabhavananda was, in turn, a direct disciple of Swami Brahmananda, the first president of the Ramakrishna Order and one of Sri Ramakrishna's closest disciples. A friend of Isherwood's pressed him to meet Swami Prabhavananda, so he did, though Isherwood didn't have very high expectations for the meeting. Isherwood had just one serious question to ask the swami and if "his answer was unsatisfactory to me, there would be no point in our ever seeing each other again." "In essence it was: Can I lead a spiritual life as long as I'm having a sexual relationship with a young man?" The swami answered correctly. "You must try to see him as the young Lord Krishna," Swami Prabhavananda said. As Isherwood later recalled, what convinced him that he could become the swami's pupil was that the swami "hadn't shown the least shadow of distaste on hearing me admit to my homosexuality." Thus began Isherwood's 35-plus years as the swami's disciple, which is the subject of his spiritual masterwork. My Guru and His Disciple is an antidote to the good-intentioned evil of hagiography. As put so succinctly in its Wikipedia entry, hagiography has become a pejorative term for biographies and histories written about saints and religious figures that are uncritical of their subjects or even reverential in tone. While it's understandable why a disciple might want to write only flattering things about his or her guru, to shade the truth or lie by omission is a huge disservice, particularly to later seekers who will never have the opportunity to meet the guru in person. The result of hagiography is to turn the guru into a perfect being, someone who descended out of the clouds and crapped sandalwood. While such holy figures may inspire awe in beginners, they become totally unreachable as human beings and thus have little utility to most seekers who have progressed beyond the beginner's stage. I'm reminded of this so often when I read the facile criticism of modern gurus -- my own included -- in which critics hold up past masters like Sri Ramakrishna or Swami Yogananda as paragons of modern ethical behaviour and then argue such moral rectitude is evidence (1) of the spiritual attainment of those past masters and (2) of the spiritual depravity of the modern guru who displays various petty human qualities like fear, insecurity, or other acts of small mindedness. If only they had a true picture of the human personalities of such past masters, then they wouldn't be so quick to judge the human frailties of the modern gurus. May 22 . Swami talked about Ramakrishna and Girish Ghosh. They once had a competition to find out which of them knew the bigger number of risque words. (It was amusing to hear this corny French adjective pop up out of Swami's vocabulary.) After they had both said all the risque words they knew, Girish bowed down and told Ramakrishna, "You are my guru in this also." What a great anecdote. It means more to me as a seeker than any recounting of Thakur spending days in samadhi or going into ecstasy. But imagine, for just a moment, what would happen if a YouTube video hit the Internet showing the "supposed" holy man -- thinking he was alone with just his intimate disciples -- sitting in his room at Dakshineswar spitting out the most vile cuss words, to the hysterical laughter of his inner circle. A public relations nightmare -- and thus the understandable inclination of the hagiographic whitewash. It's too bad. Isherwood's book hides nothing. His intellectual rigour -- his sincerity -- was deeply moving to me at a time when I found myself trying to integrate and synthesize my own memories of disciple life, my new found spiritual life, and my burgeoning intellectual development. Isherwood showed the way. I envy those who have yet to discover My Guru and His Disciple. How I wish I could read it again for the first time. 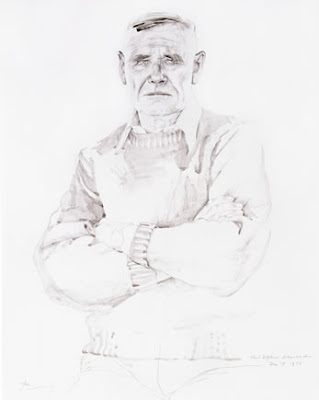 Drawing above is of Christopher Isherwood by Don Bachardy.